Successfully Added Dual Camera Rear Mirror Dash Cam - 1080P Full HD, 4.5 Inch LCD, Rear Camera, 170 Degree, Loop Recording to your Shopping Cart. For extra security on the road you can't beat a dual lens dash cam capable of recording all that goes on behind the car as well as what's happening in front. 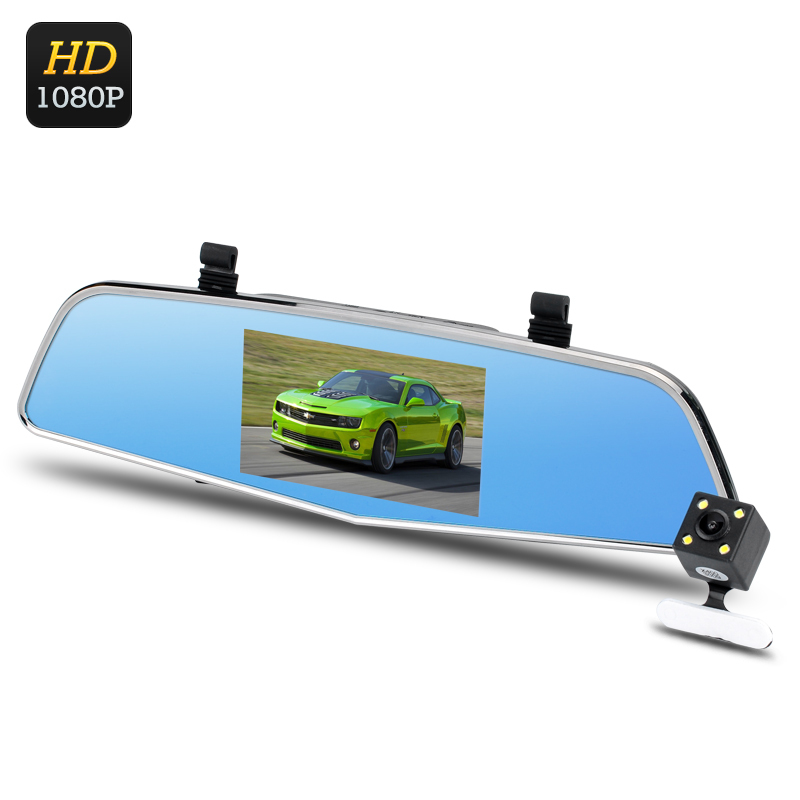 With its front mounted mirror camera recording impressive 1080P video at 30 FPS you get a crystal clear image of the road ahead, while the rear camera helps identify and record hazards approaching from behind, such as speeding or reckless motorists. Good exposure settings and adjustable white balance means day or night you get great quality footage. The rearview mirror cam wont block your view and is fairly discreet so will hardly stand out as a dash cam, ideal for capturing any unsuspecting road users who may try to catch you out with insurance fraud. The additional bonus of this mirror mounted setup is that it will not hinder your view by blocking valuable windshield space, unlike cameras that need to be mounted separately on your dashboard or windshield. Quick and effortless to install, all that's required is for you to simply clip this mirror cam onto your rearview mirror for and adjust 170 degree lens to capture the road ahead. With a 4.5 inch LCD screen this rearview mirror car DVR brings you a large viewing area for reviewing the footage and good road side playback can be indispensible once the police arrive for quickly settling any disputes. Loop recording will prevent you from running out of disc space as the camera will write over any unimportant info while the G-sensor ensures that if there's any sudden movement such as an impact or heavy breaking maneuver the cameras current footage is marked for safekeeping and locked from being recorded over. Thansk to the auto recording mode this car DVR will begin recording once you start the engine so you don't even have to remember to hit the record button, this means that it will always be there looking out for you at every turn without intruding in your day. This Dual camera car DVR comes with a 12 months warranty, brought to you by the leader in electronic devices as well as wholesale car dash cameras..